Located just steps from the Nishi-Azabu intersection near Tokyo’s bustling business and nightlife district of Roppongi, the restaurant opened 15 years ago greeting countless guest from near and far ever since. Steal away to the basement of a building along Roppongi-dori, down a narrow staircase and into a seven-seat counter space. The restaurant is elegant but with minimal decoration. After all, you're here to eat! With far more seafood varieties than typical sushi restaurants, a peek inside the storage case is a must. Equally exciting is the front-row-seat position from which you will be wowed by the chef’s finesse and skill. His techniques and combinations include many so original that guests are moved and surprised and undoubtedly filled with happy hearts and bellies for the journey home. 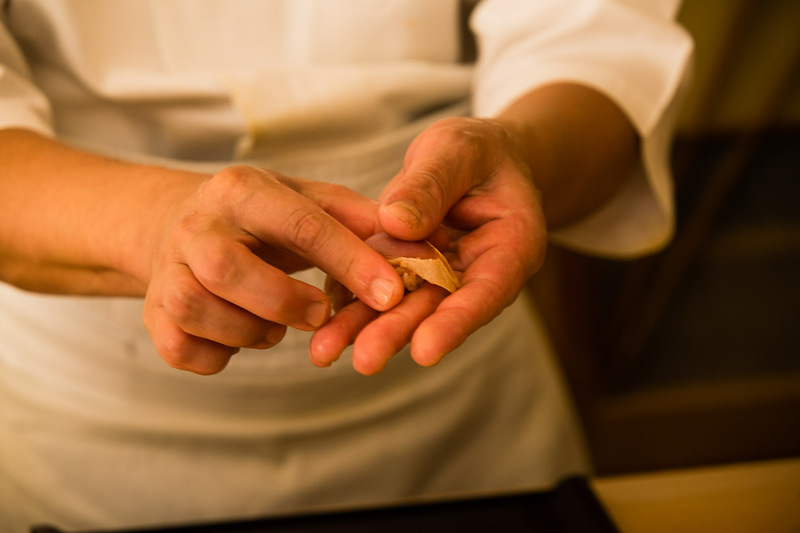 As indicated by the Sushisho name, Chef Oka is a former apprentice of world-renowned sushi master Keiji Nakazawa. A team of five greets guests with such warmth that the Internet is abuzz with excitement about this place. 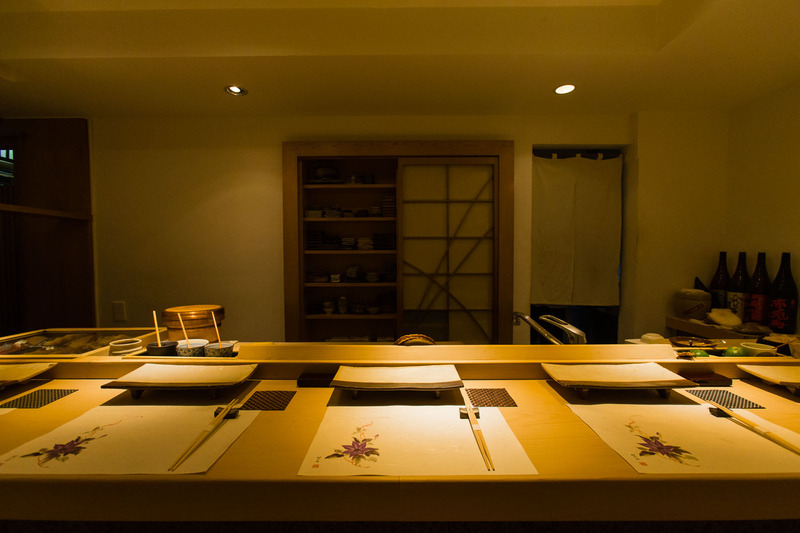 The perspective they bring to sushi is like no other, offering a refreshing experience to all who take a seat here. And with non-Japanese staff and cards explaining the many wonderful seafood ingredients, there won't be any of the confusion, tension or unknown sometimes experienced at high-end sushi restaurants. New creations and flavor combinations. In a style that pays homage to the chef’s Sushisho roots, the cuisine at Sushisho Masa consists of beautifully intertwined appetizer plates and nigiri sushi pieces. After about five plates of appetizers, Chef Oka may tease with just one sublime nigiri piece, return to a series of exquisite appetizer dishes and then wow again with nigiri. It’s an unconventional style in modern sushi in which the arrival of nigiri pieces typically signals the end of appetizer courses, made even more unique by the chef’s desire to really please his guests with totally new creations and flavor combinations. The perfect example of Oka’s flair for the atypical is a trio of katsuo bonito pieces: a marinated piece of red flesh with a secret dab of Japanese mustard, the melting texture of bonito belly that looks just like otoro, and charred sashimi pieces sandwiching delectable mild garlic that has been marinating in soy sauce for more than a month. Presented as a selection of different proteins and tasting so drastically different in terms of appearance, texture and flavor, guests are always shocked to learn this dish is all bonito. 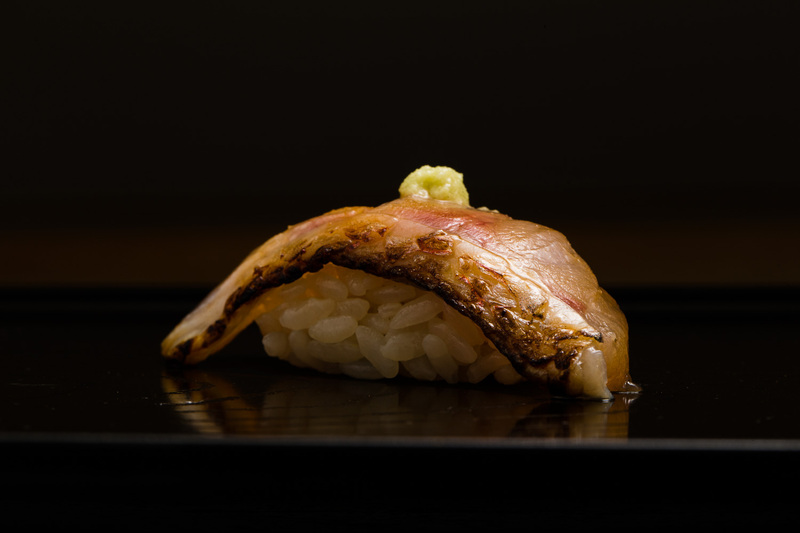 Oka felt limitations on the variations for maguro but found a world of delicious possibilities when it comes to bonito. 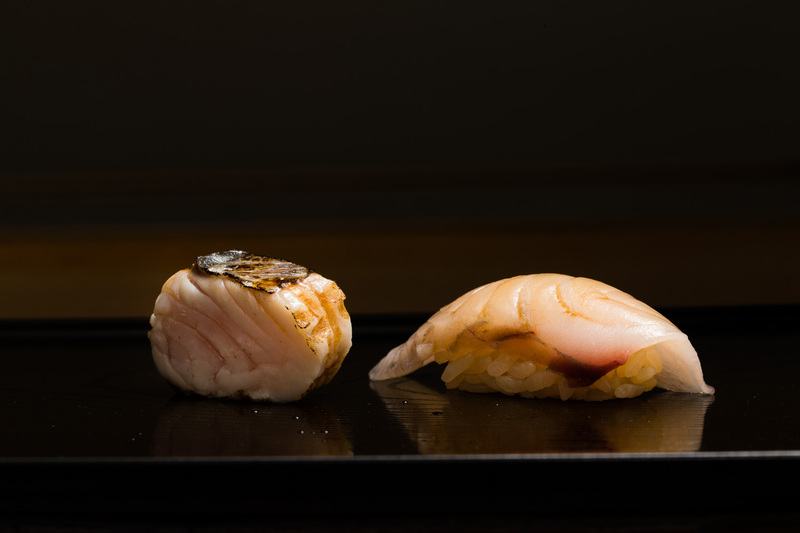 The theme of three ways is often also followed for buri yellowtail and anago conger eel, the latter of which typically includes salt-grilled and simmered variations that surprise guests with the very different textures – plump with some bite versus soft, fluffy, and falling apart flesh. The chef’s signature dish of “toro-feuille” is a decadent creation layering thinly sliced fatty tuna with generous helpings of wasabi. Made this day with the fatty part of tuna fished off Toi on Hokkaido’s southern tip, the sight of the mountains of wasabi may alarm some diners, but the chef is certain you will adore its flavors, perfectly balanced with the tuna’s delicious fat. The tuna revelations don’t stop there; while convention calls for akami to be followed by chutoro and otoro, heading to progressively fattier portions, Oka turns all that on its head choosing to go in the opposite direction, preferring to close with the umami-rich red flesh portions of akami. 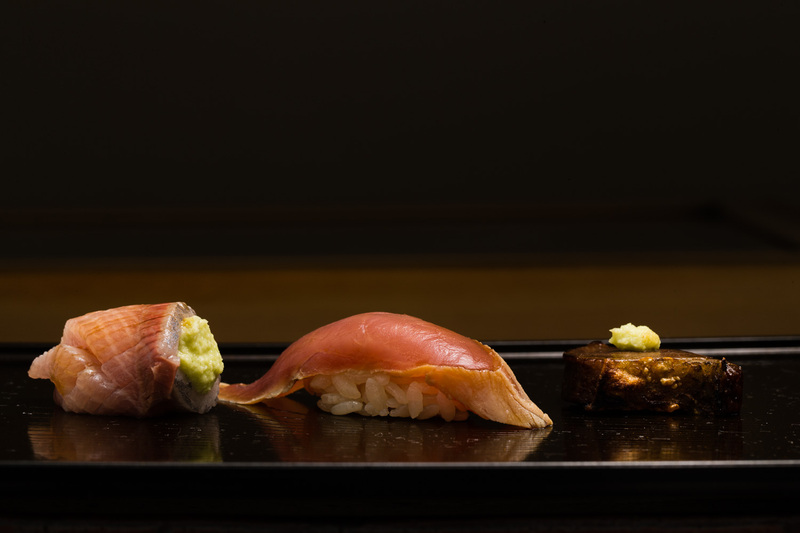 Overall, Sushisho Masa offers a wonderful course of delectable flavors that show the chef’s deep respect for sushi conventions of old, whilst exploring the possibilities this amazing world can offer. 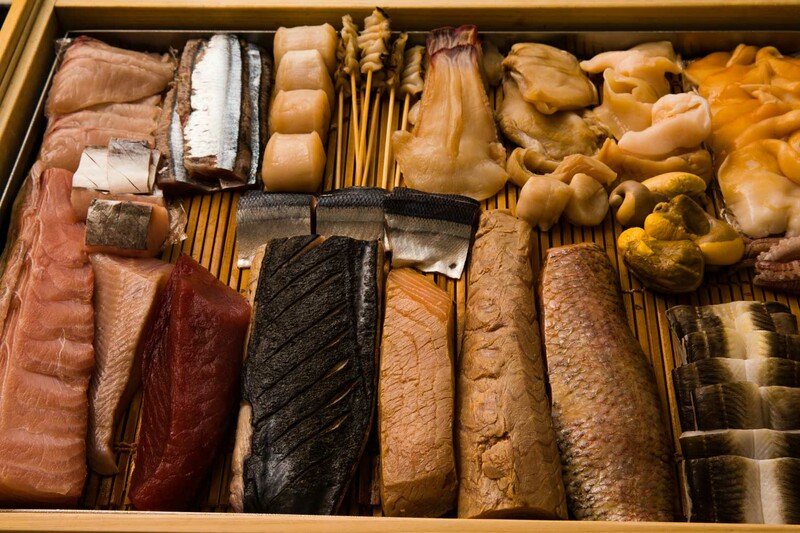 Most of the bountiful seafood comes to Sushisho Masa via Tsukiji Market but is also procured directly from Hokkaido’s Hakodate market and the marketplace in Hakata on the south island of Kyushu. 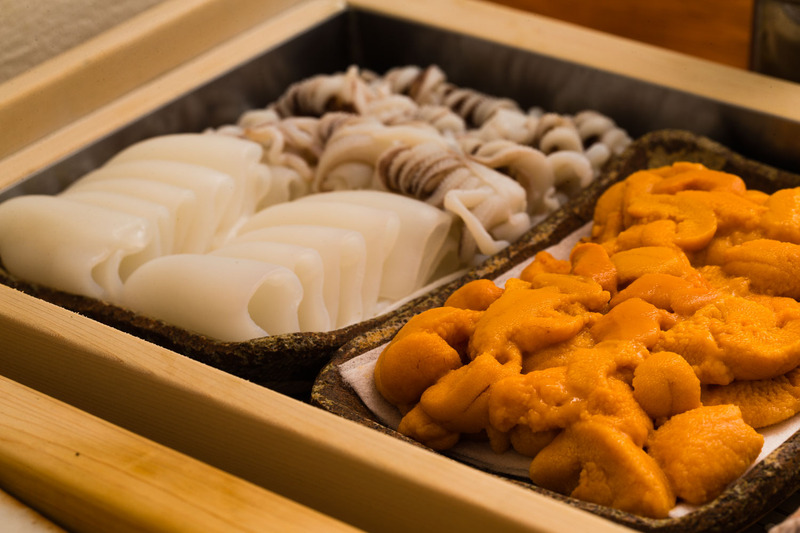 In peak uni sea urchin season, a meal at Sushisho Masa includes both akauni and murasakiuni, allowing you to compare the umami, sweetness and depth of flavor of these two premium varieties. 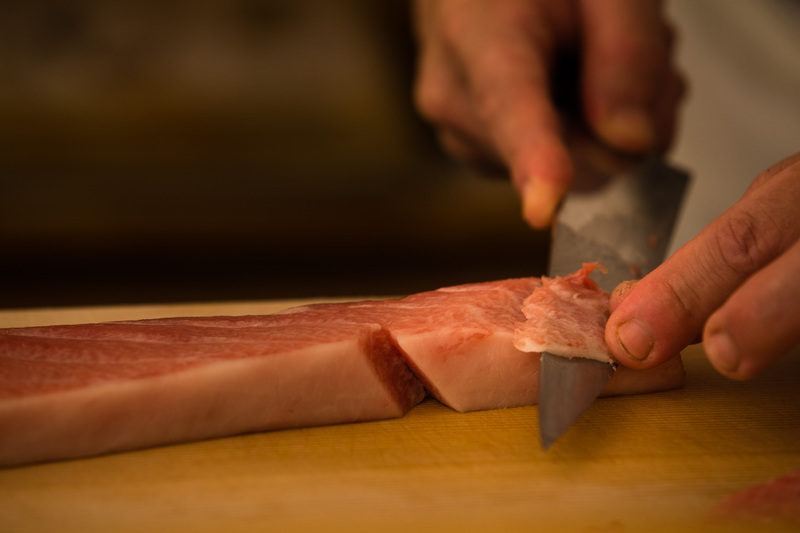 Oka is not shy about using ingredients not typically seen at sushi restaurants. The only prerequisite is that it be delicious. With former master Chef Nakazawa now based in Hawaii, Oka is exposed to many new kinds of fish, and one particularly well-received one is opah (akamanbo), served as sashimi, blanched or marinated. Deep-water skilfish found in waters off Hokkaido and Chiba is another exquisite product: with rich fat, cooking softens the bones leaving tender juicy flesh that is almost unbearably delicious. Oka’s rice ovals are made from a blend of Akita Komachi and Hitomebore varietals that have been allowed to rest for a year after harvest. His original vinegar blend contains four different types, three of which are akazu red vinegars. And for that delicious kick, wasabi is sourced direct from Shizuoka Prefecture. Masakatsu Oka was born in Chiba Prefecture in 1973. He was attracted to the fun of the world of cuisine from a young age, seeing his father run a yakiniku restaurant. 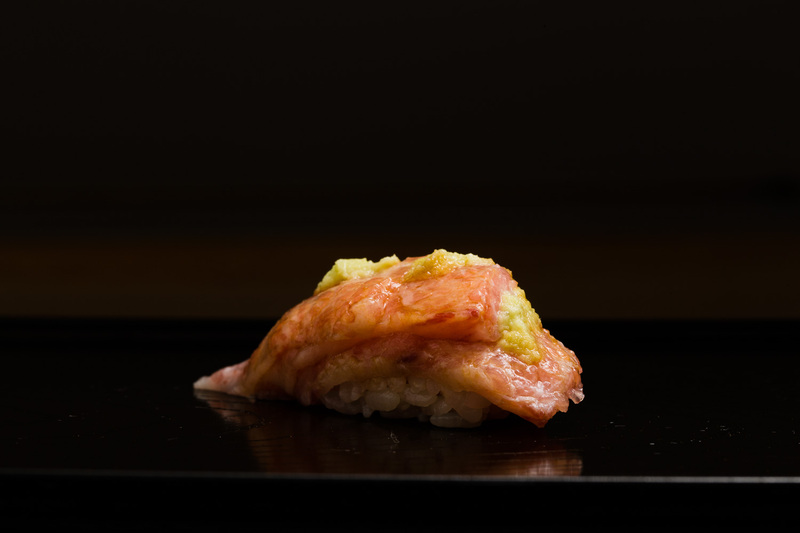 Having been exposed to various genres during his cooking school days, Oka chose sushi for its simplicity. He worked at sushi restaurants in Ginza and Roppongi for several years until one day he met Keiji Nakazawa, who was just 27 at the time. Oka decided to join Sushisho, training there for six years, followed by two and a half years at Umi in Aoyama, the former home of another sushi legend Chef Nagano. Then, obsessed with testing how well he could go on his own, Oka took to Osaka and Toyama to further polish his skills. Upon his return to Tokyo he worked under more senior fellow former apprentices of Nakazawa at Tsukishima’s Sushi Asao and Akasaka’s Sushisho Saito. Then in 2004 he seized the opportunity to go out on his own in Nishi-Azabu. Driven by the motto of “unimaginable flavors”, day after day he searches for new ingredients, combinations and challenges in a bid to wow his guests. 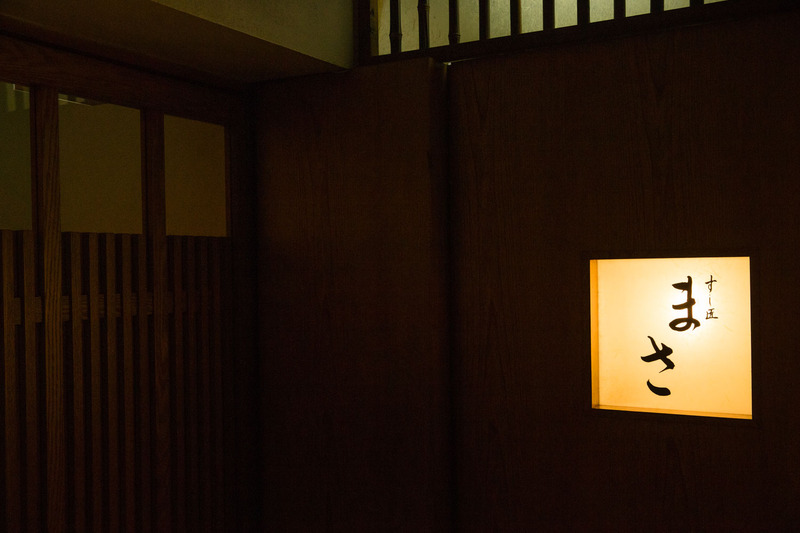 In the beginning, this pocket of Tokyo was unfamiliar ground and Oka always thought he would move his restaurant, but these days he and Sushisho Masa are an integral part of the Nishi-Azabu landscape. Work life is extremely busy and the days are long, making it all the more important for Oka to spend quality time with his family during time off. With children just eight and three years old, family adventures and outings are scheduled as much as possible. From the very earliest days, Oka had his sights on treating overseas guests to the full sushi experience, complete with written and verbal English explanations of the fantastic ingredients that make their way to the plates in his restaurant. With staff from Sweden, Macao and Taiwan, Oka and his team have a reputation as extremely warm and welcoming, creating a space that makes guests feel totally at ease. That’s difficult in a world so steeped in tradition and formality. The chef plans to continue to proactively take on young staff from around the world, driven by a desire to further spread the culture of sushi around the world. 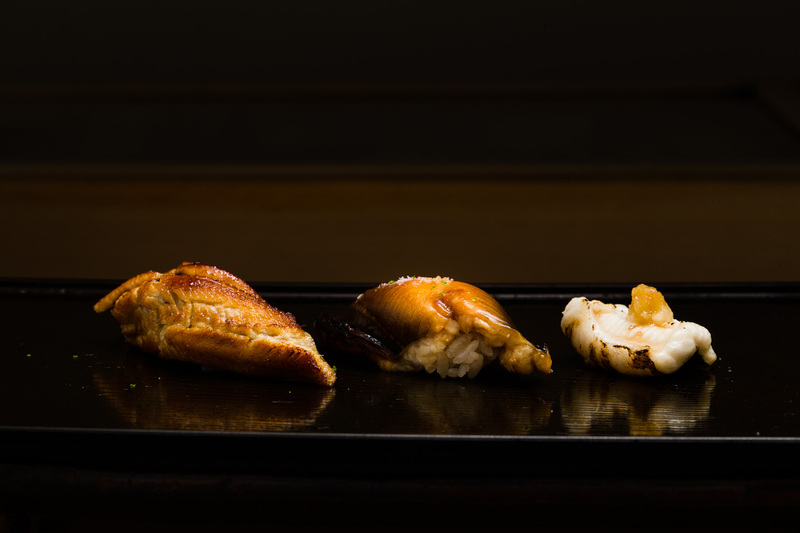 Chef Oka’s stunning seafood showcase, or netabako, takes pride of place on his counter, and contains far more items than typically seen at sushi restaurants. With an untreated timber base and broad glazed cover, the colorful array of ingredients right before your eyes is bound to whet your appetite. When you partake in a course, the meal will include a staggering fifty to sixty individual ingredients, mostly selected by the chef, but with additional dishes allowing for guests’ specific needs and preferences. The thinking behind this vast selection of seafood is the freedom to take sushi in all kinds of new directions. 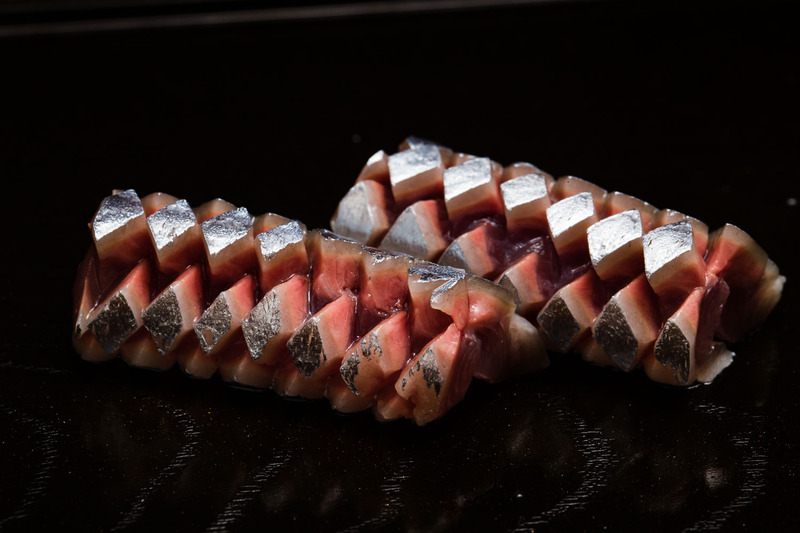 While both nigiri sushi and appetizer dishes found in most sushi meals focus on raw ingredients, Oka chooses to take items that are naturally delicious fresh and turn them into masterpieces through grilling, charring, blanching, simmering, steaming and smoking.